Here is another extremely simple card. Again, this was inspired by the same napkin as seen in this previous post. I only changed the colors and used the ladybugs instead of the butterflies. 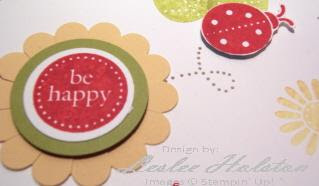 The 'be happy' flower medallion is actually covering over a mistake a creative opportunity. 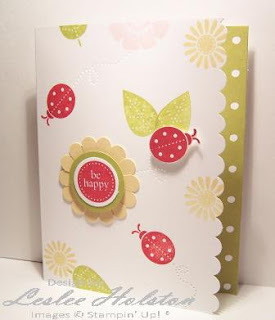 My stamped flower smudged so I took the opportunity to add the flower with a happy sentiment! I added paper piercing for the ladybug trails. The flower is a punched scallop circle and I cut up each 'valley' to create the flower petals. Like I always say, "There are no mistakes, only creative opportunities!" Thanks for stopping by today. Have a great day!